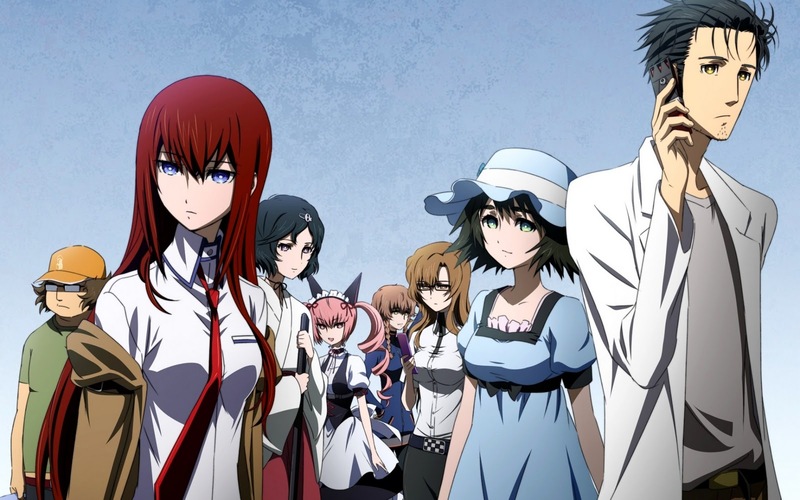 Let me start off by saying that Steins;Gate is quite possibly the best anime I’ve seen to date. I’ll try not to make this review one long squee about the show, but . . . well, fair warning and all that. If you’re a regular reader, you may remember that I mentioned Steins;Gate in my Anime Resolutions post back in January—I’m thrilled to say that I’ve succeeded in fulfilling one stage of my new years’ resolution to watch more great anime! And the amount of enjoyment I had in doing so cannot be overstated. 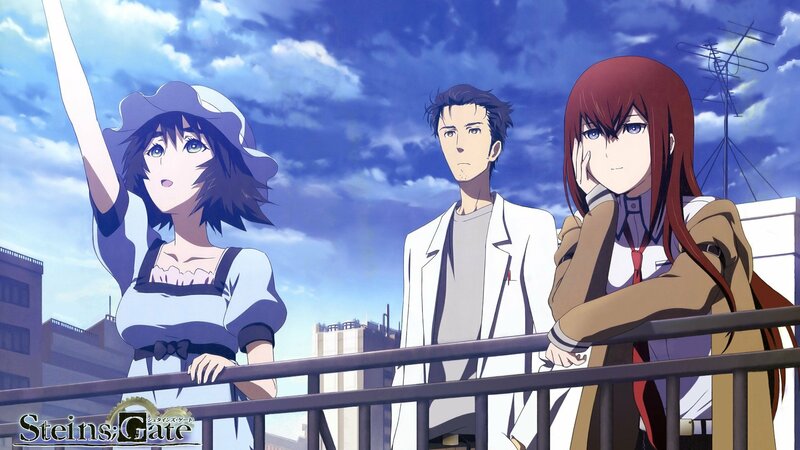 Steins;Gate originally aired in 2010—long enough ago that it’s passed out of conversations about new, relevant anime series, but recent enough that the trappings of the show don’t feel all that dated yet. Looking back at my earlier post, the summary I gave, which was cobbled together from what I could glean from the Blu-ray sleeve copy and the Wikipedia page without spoiling the plot for myself, is close to the truth, but not quite accurate. From the outside looking in, it seemed like the series would have a wacky, madcap feel to it, but while it does have its share of bizarre moments, it’s more often surreal than silly. The series takes place in Tokyo’s Akihabara neighborhood and stars Okabe Rintarou, also known as Okarin, also known as Hououin Kyouma, a self-styled mad scientist who has figured out how to turn his microwave into a time machine. It sounds goofy—and it is, at first—but don’t be fooled. The initial experiments involving time-traveling bananas soon evolve into an increasingly chaotic web that Okabe and the other members of his lab, Future Gadget Laboratory, must spend the majority of the show untangling. As the story begins, Okabe; his adorable, cosplay-obsessed best friend, Mayuri (the one who first started calling him Okarin); and his right-hand man, the genius hacker and one-track-minded Daru, learn that by rigging up their microwave in a particular way, they can send small objects and, later, text messages, through time. It’s more complicated than that, of course, but the show only briefly touches on the science of it all, which I think is for the best. Plot points like these tend to fall apart when you get too close, and it’s generally advisable to set up a basic understanding and then leave well enough alone. Okabe and friends soon start focusing on sending messages back in time via text; they call these messages D-mails (with the D standing for DeLorean). 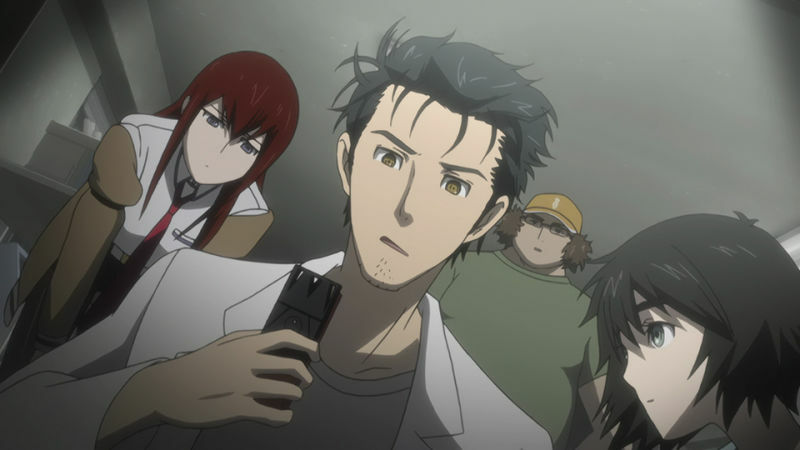 Okabe pulls more and more friends and/or lab members into his experiments, and each plays their own role in the ensuing discoveries. There’s Kurisu Makise, a young genius who’s already made a name for herself in the science world. There’s Suzuha, a scrappy teen girl with a mysterious past and a confusing future. There’s Moeka, who barely strings more than two words together out loud but who texts so prolifically that Okabe calls her Shining Finger. There’s Rukako, a transgender teen who may or may not be in love with Okabe. And last is Faris, the queen of the Moe culture that pervades Akihabara, and the primary object of Daru’s affections. The D-mail experiments start out with simple, seemingly innocuous messages, but as Okabe learns more about what D-mails are capable of, they become more daring. He and his friends soon go from causing small changes, such as altering which cell phone someone decides to buy, to altering the makeup of their entire neighborhood. They learn that with each D-mail they send, they create a new “world line,” or timeline, and that each small change to past events causes a ripple effect, the consequences of which are beyond anything they ever intended or imagined. This series is a bit of a slow burner—the beginning catalogues the (seemingly) random, mostly run-of-the-mill activities of the growing FGL group, and it takes a handful of episodes for the viewer to really get what’s going on. Between Okabe’s constant, extravagant soliloquies as his alter-ego persona, the mad scientist Hououin Kyouma; the confusing time-travel logistics; and Okabe’s bizarre yet hilarious penchant for giving himself and everyone around him nicknames that often have no basis in any context outside of his own mind, it can be a bit hard to follow things at first. However, with the increasingly sweeping changes caused by the D-mails, the tone of the show (along with Okabe’s affect) shifts from quixotic and droll to dark and dire as the implications of the FGL’s experiments become clearer. In addition to the slow start, it’s worth mentioning that two-thirds of the way in, the narrative sags a bit as some of the discoveries the characters make seem to oversimplistically solve some of the problems caused by previously established time-travel “rules.” This serves to make an already heady show feel a little inaccessible for a couple of episodes, and it throws off the tone during that time. However, things get back on track before the end, just in time for some truly brilliant (and mind-bending) twists. Before talking about the best elements of the show, I’ll touch on my other least favorite aspect of the story: namely, that inescapable time-travel trope in which the protagonist is forced to relive the same traumatic event over and over again, trying to keep it from happening countless times yet being forever unable to do so. Don’t get me wrong; it’s a trope for a reason—it’s an effective way to bring home the enormity of the consequences of time travel, and to explore what time travel might do to a person’s psyche. However, I have personally seen more than my fair share of this device recently, and it’s starting to wear on me. But if you haven’t recently watched a lot of stuff from this genre in quick succession (as I have so foolishly done), it may not cause the same unpleasantness for you. However, although there were some misses along the way, I fell in love with Steins;Gate from the very start. I loved the overall feel of it, I loved the side characters, and I especially loved Okabe’s expansive, harebrained personality and deliciously articulate, borderline Shakespearean way of speaking. This show is chock full of literary and other nerdy references, as well—as a certified geek, I got many of them, but I could tell there were a lot more that I didn’t, which is just one of the many aspects of this show that will make it highly rewatchable. Beyond the more superficial components, there is also a lot to love in terms of characterization. I enjoyed the characters’ interactions with each other—the constant friendly ribbing, the way everyone lets Okabe go off on his tangents while behaving as though this is all business as usual, and the way they accept new friends and old for who they are, without any judgment or effort to change them. And as the story progresses, it becomes more and more apparent that, despite the flashy, narcissistic persona he is wont to adopt, Okabe cares deeply about his friends and would do anything to protect them. Some of the best parts of the story are when Okabe realizes that it is this, even more than his genius, that makes him who he is and defines his place in his world. Additionally, there are a number of great meta aspects to the show. For one, it’s one of the best dubs I’ve ever seen. All of the voice actors were excellent, and the dialogue didn’t take on that wooden quality it so often does with dubs. I also didn’t feel like the dialogue had been gutted of the emotion and humor that came with the original, which is a rare occurrence for dubbed anime. Beyond this, the series almost seemed to rise above the anime genre itself; while watching it, I felt like I was simply watching a great piece of fiction, rather than being constantly hyperaware of the fact that I was watching anime. I have nothing against the over-the-top, in-your-face quality that anime tends to have—on the contrary, that’s often what’s so great about it. However, it can feel grating at times, and Steins;Gate at turns departed from this and used it to its advantage, making it one of the richest anime series I’ve seen in some time. This anime has much more depth, pathos, and gravitas than a viewer might assume at first glance, and is a great one to show that friend who thinks all anime is absurd and unintelligible, or the one who thinks they’ve seen everything the genre has to offer. It’s not a lighthearted anime, nor is it for the faint of heart—however, it is anime at its best, with taut storytelling, memorable characters, and ideas that you’ll find yourself pondering for days after you finish the last episode.